Earlier this week a video of a man flying on a tiny hoverboard set the Internet on fire. 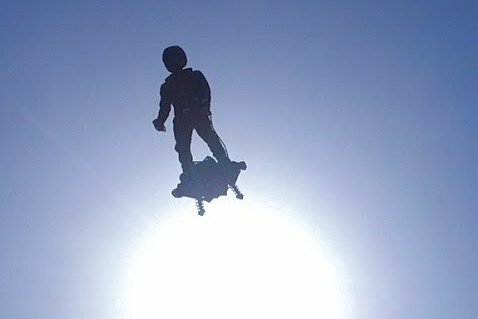 The board, called the Flyboard Air, was so small and the flight looked so stable and easy that many people thought the video was fake. According to the inventor, Franky Zapata, word of the skeptics was the ultimate compliment. That’s because they wanted it to look fake. The Flyboard Air builds off the original Flyboard, which is tethered to a jet ski and uses water for propulsion. The new version is sort of like a jet pack on your feet. Remarkably this tiny device has the potential to travel 95 mph and reach heights of 10,000 feet, but no one is there yet, not even Zapata who recently broke world record for longest hoverboard flight at 275 meters. Building off the success of Flyboard and widespread interest, Zapata and his crew at Zapata Racing have reportedly been developing this latest incarnation for the past four years. But not everybody can ride it. Zapata says it takes at least 100 hours on the original Flyboard and about 20 more hours training for the new one. The board utilizes four engines and two turbines on the side for stability. That along with the balance of the rider helps keep it going in the direction you want. An algorithm was developed to calculate that stability similar to drone technology, but it’s still not easy, admits Zapata, who actually took a plunge in the water during one of the test flights. For now though, Zapata and the team are working on a consumer version that you sit on and can be used for everyday transportation. And in a few weeks look for Zapata to break the world record for longest hoverboard ride.